Cantucci are perfect for dunking in chocolate, coffee, or Vin Santo. Cantucci is a cookie we make often and we also give it away for the holidays to our loved ones. 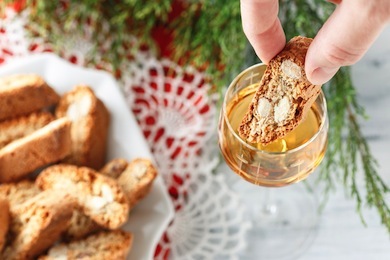 Cantucci can be dipped into chocolate, coffee, or Vin Santo. Preheat oven to 300 degrees F.. Toast almonds in oven for 20 minutes. Mix flour, sugar, eggs, zest of orange and lemon, baking powder, and vanilla together. Knead slowly until the mixture becomes a firm ball. Place strips of dough onto oiled baking sheet. Brush lightly with egg wash. Place in oven for 20-25 minutes until lightly browned. Remove from oven. Slice the cantucci with a bias cut. Cool and store. This will be a somewhat soft cookie. Option: Place cantucci back in the oven with the cut side up for 10 additional minutes. Cool completely. This will be a very firm cookie. ** You can use your favorite roasted or raw nuts in the recipe. One of our nonnas prefers hazelnuts. Try this traditional autumn comfort food recipe from Chef Dania. This delicious side dish can be paired with any meat or poultry dish or served alone. Vegetable stock: Place the courgettes, Swiss chart leaves and asparagus spears in a saucepan with 4 pints of salted water and cook for 20 minutes over medium heat. This vegetable stock is the cooking liquid for making the risotto and should be prepared first. Keep it simmering constantly. In a saucepan, melt the butter and sauté the onion for 3 minutes. Add all the vegetables and sweat them over low heat. After 10 minutes, add the rice and stir until it becomes translucent. Add the vegetable stock a little at a time, stirring continuously. After about 18 minutes, add the chopped herbs. When the rice reaches al dente stage, take it off the heat, taste and correct for salt. Mix in the grated Parmesan cheese. Garnish with a few courgettes slices and serve at once. 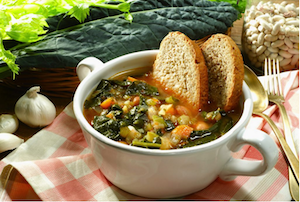 Ribollita means “reboiled”. This Italian interpretation of leftovers resonates with everyone who believes many dishes actually taste better the next day. Ribollita is resplendent with layers of flavorful textures. Every kind of vegetable, fresh, frozen or previously cooked, will taste great in this recipe. Soak the dried beans overnight in water. Pour off the water. Place in fresh water and cook until tender. Drain and reserve the bean cooking liquid. Heat the olive oil in a large pot and cook the carrots, celery, and onion over low heat for about 15 minutes. Add the tomatoes and cook for another 15 minutes. Then add the beans and half the reserved cooking liquid. Season with salt and pepper to taste. Cook on low heat for 30 minutes. Add the Tuscan kale, Swiss chard, and cabbage and cook for 60 minutes, adding the remaining cooking liquid. Add water or broth for the consistency you want. To serve, arrange slices of the toasted bread to cover the bottom of a soup bowl and ladle a serving portion of soup on top of the bread. Let stand a few minutes before serving. Serve extra bread on the side. Serve with a drizzle of olive oil. Serves 4-6. 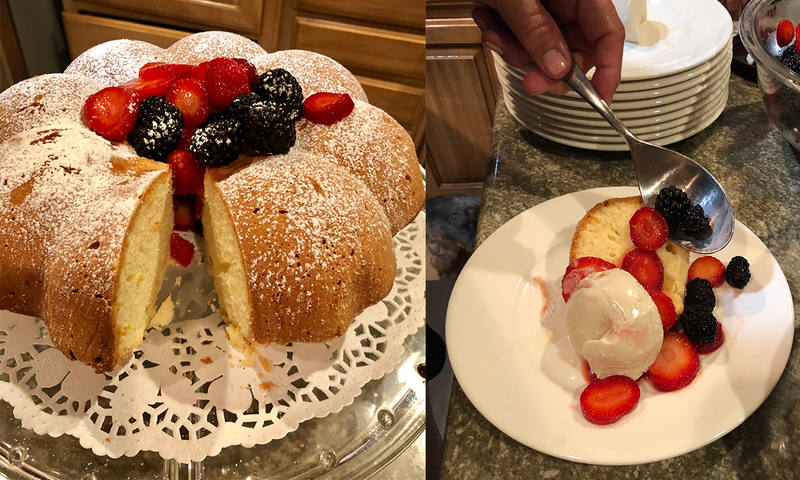 This flavorful little cake was served to us with afternoon coffee by one of our neighbors, Simonetta. Simonetta is the daughter of one of our first nonnas, Iolanda, who is a culinary legend in Montefollonico. Both are natives of the Tuscan village of Montefollonico and this coffee cake recipe has been a favorite of her family for generations. Buon appetito! Preheat oven to 350° F, rack in the center. 10-cup, tube or Bundt type pan, sprayed with non-stick spray. 1. In a mixing bowl, blend butter and sugar until light and fluffy, about 3 minutes. Add eggs one at a time, blending in between each addition until fully incorporated. 2. In a medium bowl, whisk together cake flour, baking powder and salt. Add one-third of the flour mixture to the batter and mix well. Add in one-half cup milk and mix well. Continue adding in the flour mixture in thirds, alternating with the remaining milk, blending until all is mixed well. 3. Fold in the orange zest. 4. Pour the mixture into the prepared pan, smoothing to the edges. Place in preheated oven until a toothpick inserted into the center comes out clean, about 45 minutes. 5. Place on a cooling rack for 10 minutes, then invert onto serving plate. Dust with additional powdered sugar prior to serving. Serves 10 to 12. OPTIONAL: This cake can be served with a scoop of your favorite gelato or ice cream and fresh seasonal fruit.